One day, a telephone call came into my design shoppe. A man on the East Coast began speaking about a table ensemble for a room in his and his wife's home. He stated that the theme for the room was an English Hunting Lodge. The result was a three table ensemble with all three tables snuggling together in a "jigsaw puzzle configuration", wrapping in front of an "L" shaped leather sofa. "Bears" being the principal theme for the ensemble setting in an "English Lodge" theme room. WA LA! Costs vary, as you might imagine, depending up quantity, size, details of sculpture, and materials selected. We work with wood, stone, and bronze. Original carvings ranging in detail up to and including incredible detail of an eyebrow. Yes we are THAT good! Costs can start at $3,400 for a small original piece. 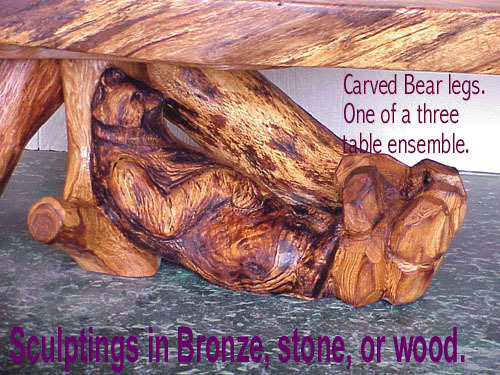 The above "Bear" table ensemble of three tables, each with a carving: Mamma bear, Pappa bear, and baby bears playing in a mountain stream could be re-created for about $14,000. If you are looking for such a design: Let us know thoughts. Sketches and renderings available. Contact us, below. Carvings and sculptings available - as tiny as a lady bug, cast in bronze OR hand chiseled in stone. Tall as a three story building and/or with the detail of a bugs antenne, a glint in the eye or, the hairs of an eye brow! in progress - Center piece, base of 3 pc. ensemble. the Car Davi is a 3 piece design in which was used as the basis of the design, a unique sliced, annual ring materials of the Kansas Oak tree (salvaged materials). 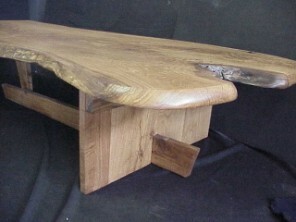 The three pieces form an "L" shaped coffee table ensemble. The three mate together using well scribed edgings that form a jig saw puzzle type of loose connection. Additionally, the base of the ensemble is scene of "Bears" which are a combination relief carving & sculpting created by Chet Cale, the sculptor of our group. The scene, when finished and viewed from across a room will depicts the theme of Mamma & Pappa bears watching serenely & pridefully, watching their cubs, fishing for their own food, in a mountan stream. Don't we ALL wish that for our children? What you are viewing below, is the detailed carving of the fishing portion of the scene. Mamma and Pappa bears are currently in progress in the studio (photo's coming soon). Notice the clouds Chet has put into this scene..
"Nice work Chet! As always." 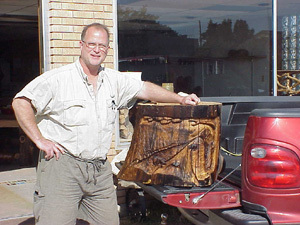 Carved furniture and carved table bases are exciting projects. 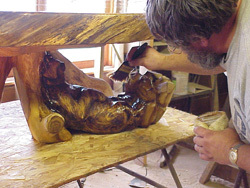 The project allows us to combine our talents and work together in creating your carved or sculpted works. 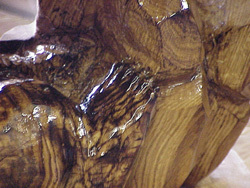 Whether your work is in stone, wood, bronze, or a combination; it is a thrill for us! Choose a theme or let us help you select one and we can then, work on detailed designs for your review. 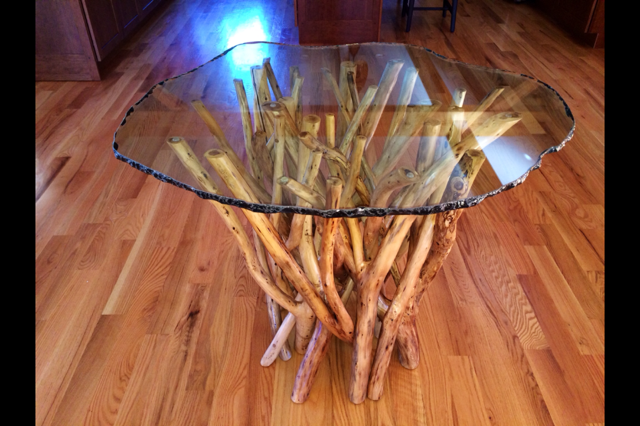 Glass tops, etched or sculpted, granite tops wood or stone, or uplit, carved glass table tops? Even uplit translucent onyx tops or cast bronze bases. Let your imagination go!!! 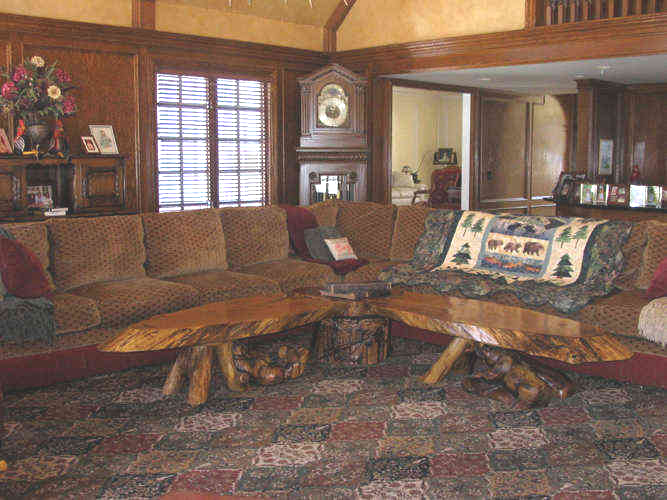 This three piece carved-sculpted ensemble graces the family room. Theme of the table was arrived at via discussion between Carol (owner) and Chet Cale (sculptor). Theme for the room - "An English Hunting Lodge" as established by the owners. Carvings on the table from left to right are; Mamma Bear relaxing, watching her cubs (center) play in the mountain stream. Pappa bear is standing guard. The sculpture makes a statement of the grace and awe of nature. Each theme table is a work of art. A one of a kind creation. Created in collaboration between yourself and us. The owners of this theme table "the CarDavi have graciously consented to serve as reference should you require. Thank you Ron and Carol. To create and acquire your theme table, send your request for discussion directly to the artisans. We will respond with appointment arrangements. We look forward to the experience.